It was a lovely weekend, maybe too spring-like for mid-February, but the turnout and results made it all worthwhile at the Sun Valley Junior National Qualifier Feb. 12-13 at Lake Creek north of Ketchum. Sun Valley Junior Nordic ski team coach and Chief of Competition Rick Kapala called it a great race series, one that finalized the Intermountain Team for Junior Nationals. After the freestyle and classic races at Lake Creek, 17 Sun Valley Ski Education Foundation cross-country ski athletes qualified to compete at the 2011 USSA Junior Nationals March 6-12 in Minneapolis, Minn. 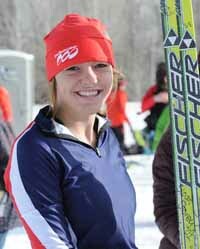 In all, 170 skiers took part in last weekend's races including 75 ages 7-19 from the SVSEF. OJ/J1 girls (ages 16-19): Annie Pokorny, Sloan Storey, Kelsey Dickinson, Carrie Heagney, Maranda Stopol, Morgan Atkinson, Emily Williams and Kaitlyn Landis. J2 girls (14-15): Maggie Williams and Katie Feldman. OJ/J1 boys: Scotty Phelan, Max Christman, Torin Tucker, Andrew Pfeiffer and Daniel Sundali. J2 boys: Stephen Pfeiffer and Jake Adicoff. Highlights of Sunday's classic racing included: Scotty Phelan, 19, leading 73 male racers in the 5-kilometer classic; and Sun Valley's Annie Pokorny, 18, Maggie Williams, 15 and Sloan Storey, 16, placing 1-2-4 in the female 5k classic event. Saturday's freestyle event featured a couple of photo finishes for first place. Bridger Ski Foundation J1 Cole Morgan nipped Sun Valley OJ Max Christman in the men's 15k skate race, and Maggie Williams shaded McCall's Anika Miller by the blink of an eye in the J2 5k freestyle finale. Christman, Phelan and Daniel Sundali placed 2-3-4 behind Morgan in the 15k skate, while Sun Valley's J1 Sloan Storey and OJ Carrie Heagney went 1-2 in the women's 10k freestyle. Besides the aforementioned racers, SVSEF class winners were Annika Landis, Ella Wolter, Cash Dart, Crosby Bowe, Cheyanne Stopol, Johnny Hagenbach and Maddy Watts. Older Junior (18-19) boys' 15k freestyle: 1—Max Christman 42:14 (2nd overall of 46 finishers). 2—Scotty Phelan 42:24. 3—Daniel Sundali 42:28. 10—William Spiller 45:31 (12 racers in the class). J1 (16-17) boys' 15k freestyle: 3—Torin Tucker 42:40. 5—Andrew Pfeiffer 43:41. 15—Gray Riedinger 45:20. 21—Jackson Long 46:04. 24—Zach Lindahl 48:38 (35 racers). OJ girls' 10k freestyle: 1—Carrie Heagney (2nd overall of 16 finishers) 33:25. J1 girls' 10k freestyle: 1—Sloan Storey 32:42 (1st overall). 4—Morgan Atkinson 34:40. 7—Maranda Stopol 35:03. 10—Emily Williams 35:40. 12—Kaitlyn Landis 38:31 (14 racers). J2 (14-15) boys' 5k freestyle: 5—Jake Adicoff 14:51. 6—Stephen Pfeiffer 15:00. 7—Nathan Nasvik 15:04. 12—Nate Thomas 15:17. 16—Andrew Graves 15:43. 18—Ty Reinemann 15:45. 22—Andrew Morse 16:15. 23—Calder Zarkos16:45 (30 racers). J2 girls' 5k freestyle: 1—Maggie Williams 16:06. 10—Katie Feldman 17:43. 12—Brooke Lawrence 18:09. 14—Sarah Williams 19:02. 15—Elana King-Nakaoka 19:07. 17—Haley Montgomery 19:33 (20 racers). Novice girls' 3k freestyle: 1—Cheyanne Stopol 12:14. J3 (12-13) boys' 3k freestyle: 7—Peter Wolter 8:34. 9—Danny Graves 8:42. 12—Thomas Gillespie 8:56. 14—Zach Williams 9:02. 15—Lukas DeWolfe 9:12. 17—Cameron Bingham 9:15. 18—Carter Ros 9:21. 19—Benjamin Brunelle 9:24. 20—Theo Castellano Wood 9:26. 22—Jacob Truxal 9:36 30—Xavier Haemmerle 10:53. 31—Callum Stearns 11:35 (33 racers). J3 girls' 3k freestyle: 1—Annika Landis 8:43. 5—Maddy Watts 9:08. 7—Emily Siegel 9:45. 11—Victoria Castellano Wood 10:26. 13—Grace Gorham 11:12 (15 racers). J4 (10-11) boys' 2k freestyle: 3—Logan Jones-Wilkins 6:53. 4—Taylor Koth 6:55. 8—Cooper Roquet 7:11. 9—Keene Morawitz 7:24. 10—Henry Raff 7:58. 11—Landon Nurge 8:20. 13—Jorgan Lawrence 9:46 (16 racers). J4 girls' 2k freestyle: 2—Lillian Brunelle 7:45. 8—Sophia Coplin 9:07. 9—Tess Burchmore 9:19. 12—Sarah Truxal 10:39. 13—Ellie Gorham 10:58 (15 racers). J5 (8-9) boys' 1k freestyle: 1—Johnny Hagenbach 3:21. 3—Luke Dean 3:36. 5—Tully Jones-Wilkins 3:54. 7—Caelin Bradshaw 4:43 (8 racers). J5 girls' 1k freestyle: 1—Ella Wolter 3:31. 3—Jenna Nurge 4:03. 4—Eva Carlson 5:16. 5—Adela Pennell 6:02. J6 (1-7) boys' 1k freestyle: 3—Ridge Dirksmeier 4:22. 4—William DeWolfe 4:24. 5—Skylar Maguire 4:55. J6 girls' 1k freestyle: 1—Crosby Bowe 5:48. Master Men 10k freestyle: 2—Del Pletcher 33:18. 3—John Tormey 35:02. 4—Pat Simpson 35:05. Master Women 5k freestyle: 1—Muffy Ritz 16:19. 2—Rebecca Rusch 18:01. 3—Robin Potts 18:43. 4—Katharine Sheldon 20:30. Older Junior (18-19) boys' 5k classic: 1—Scotty Phelan 14:40 (1st overall of 73 finishers). 3—Max Christman 15:24. 9—William Spiller 16:02. 11—Daniel Sundali 16:04 (12 racers). J1 (16-17) boys' 5k classic: 4—Brandon Wade 15:16. 5—Torin Tucker 15:26. 10—Jackson Long 16:00. 11—Andrew Pfeiffer 16:02. 14—Gray Riedinger 16:15. 15—Ketchum Wilt 16:29. 21—Zach Lindahl 16:44 (37 racers). OJ girls' 5k classic: 1—Elizabeth Ann Pokorny 17:18 (1st overall of 30 finishers). 3—Carrie Heagney 18:41 (3 racers). J1 girls' 5k classic: 2—Sloan Storey 17:48 (3rd overall). 4—Maranda Stopol 18:29. 7—Emily Williams 19:59. 11—Kaitlyn Landis 20:55. DNF—Morgan Atkinson (15 racers). Novice girls' 3k classic: 1—Cheyanne Stopol 12:34. J2 (14-15) boys' 5k classic: 2—Stephen Pfeiffer 16:18. 5—Jake Adicoff 16:39. 7—Nate Thomas 17:01.0. 8—Ty Reinemann 17:01.5. 14—Nathan Nasvik 17:45. 17—Andrew Morse 18:22. 18—Andrew Graves 18:33. 22—Calder Zarkos 19:16 (30 racers). J2 girls' 5k classic: 1—Maggie Williams 17:42 (3rd overall). 10—Katie Feldman 20:14. 12—Haley Montgomery 20:40. 13—Elana King-Nakaoka 21:10. 14—Brooke Lawrence 21:13. 16—Sarah Williams 21:59 (20 racers). J3 (12-13) boys' 3k classic: 8—Danny Graves 9:23. 12—Benjamin Brunelle 9:53. 13—Thomas Gillespie 10:02. 14—Theo Castellano Wood 10:05. 16—Peter Wolter 10:13. 18—Zach Williams 10:15. 23—Carter Ros 10:46. 26—Lukas DeWolfe 11:00. 29—Xavier Haemmerle 11:38. 30—Alex Feldman 13:14. 31—Callum Stearns 13:29. DNF—Cameron Bingham (33 racers). J3 girls' 3k classic: 1—Maddy Watts 9:24. 2—Annika Landis 9:28. 9—Victoria Castellano Wood 11:04. 10—Grace Gorham 11:07. 12—Emily Siegel 11:22 (15 racers). J4 (10-11) boys' 2k classic: 3—Taylor Koth 7:20. 7—Logan Jones-Wilkins 8:06. 8—Keene Morawitz 8:11. 9—Cooper Roquet 8:29. 11—Henry Raff 10:08. 12—Landon Nurge 10:18. DNF—Jorgan Lawrence (15 racers). J4 girls' 2k classic: 4—Lillian Brunelle 8:57. 6—Sophia Coplin 9:56. 11—Tess Burchmore 11:12. 12—Sarah Truxal 11:38. 13—Ellie Gorham 11:48 (15 racers). J5 (8-9) boys' 1k classic: 1—Cash Dart 3:57. 3—Tully Jones-Wilkins 4:19. 5—Brogan Ros 4;27. 6—Ethan Hunt 5:19. 7—Jake Gorham 5:28. DNF—Luke Dean (8 racers). J5 girls' 1k classic: 1—Ella Wolter 3:56. 3—Jenna Nurge 4:39. DNF—Eva Carlson, Adela Pennell and Ella Guy. J6 (1-7) boys' 1k classic: DNF—Ridge Dirksmeier and William DeWolfe. J6 girls' 1k classic: DNF—Crosby Bowe 5:48. Master Women 5k classic: 1—Joan Scheingraber 18:13. 2—Muffy Ritz 19:40. 3—Kim Nalen 22:30. 4—Joney Otteson 23:35. 5—Katharine Sheldon 25:06. 6—Karen Simpson 28:31. DNF—Rebecca Rusch.